So I was at the local horse-product store this morning, purchasing worming paste in a syringe and hoof-strengthening supplements (the sort of thing you routinely pick up while running errands after a hayburner has plodded into your life; it goes along with finding yourself saying things like "Why is your stud chain in the bathroom?" without thinking it strange). 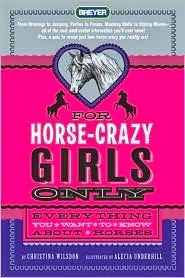 As the cashier rang up my purchase, I glanced to my right and saw someone else's items on the counter: a bag of brightly colored socks spotted with little horse images--and a copy of For Horse-Crazy Girls Only. Two little girls were darting around the store, now that they'd finished trying on new jodhpurs. "Excuse me," I said to the cashier. "Is...is somebody buying that book or is it just, like, on the counter?" "They're buying it," she replied, indicating the girls and their mom. Inwardly I waffled a bit, being a Rather Hesitant sort of person, but finally allowed that, if they'd like, well, I kind of sort of wrote that book, and would be happy to sign it. Yes, please! they said, providing a name to put in it. Hannah it was...double points for the day because not only did this lovely coincidence occur, but also the recipient of the book has a palindrome for a name.